If you're trying to run an ASP.NET app under IIS7 in Windows Vista, you may receive a page informing you that "HTTP Error 404.3 - Not Found" has occurred. If so, here's what you have to do to correct the situation. 1. Click on what used to be the START button (the round button in the lower left hand corner of the screen with the Windows flag in it) and go to Control Panel. 2. If you are using the deafult view (the "Control Panel Home" text in the left pane will be highlighted), click on the Programs link. If you're using the classic view, double-click on Programs and Features. 3. 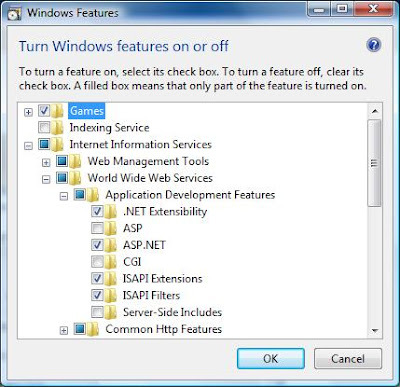 Click on the Turn Windows Features On or Off link. 4. A security prompt will appear. Click Continue.